The rat and pig compatibility is excellent no matter what kind of relationship they are in. Whether it be romantic or friendship or even in a business relationship, they work very well together. Generally the rat is very happy being the center of attention, especially when the attention is lavished on them from their close friends. In turn, they rat treat their loyal friends better than anyone around them. The Chinese pig animal sign fits in nicely with this dynamic, since they put their friends and family first. This makes them an ideal member of a rat’s group of friends. They are normally very positive, looking at others and seeing only their good traits rather than their negative ones. This Chinese zodiac compatibility between the rat and pig work very well together. Any issues they might have with each other are not so tremendous they can’t be overcome. The compromise required to make the Rat and Pig relationship work isn’t so hard or difficult to make them feel that it isn’t worth it, but rather an easy kind of compromise to make things better for each other. While dating, the rat will revel in treating the pig with the luxurious items the pig enjoys most. However the rat tends to lead a lifestyle with a rapid pace and the pig has a fondness for sleeping late which might irritate the rat from time to time. The rat and pig in love form a lively couple. Their attraction for each other encompasses both physical and mental attributes. Sometimes their simplistic view might be a little too unrealistic for the long-term. Their relationship will need something a little sturdier to hold it together. With friends being very important to both the Chinese horoscope signs, they will enjoy entertaining in their home. They love each other’s open and lively natures and share similar interests and beliefs. The Rat Pig couple make true soulmates. The rat man or woman will tend to be more responsive and realistic of the two. Their knowledge is highly appreciated by the pig, who will often give more than they take, almost to a detriment to their lover. The Rat and Pig marriage compatibility is most successful when the rat cares about what is best for the pig and pays attention to those matters. The Chinese astrology sign pig can be a bit gullible and innocent and is often taken advantage of. The rat tends to be the opposite of this, remaining suspicious of others until they prove their worth and their intention. As long as the pig man or woman values the rat’s instincts, they should have no issue overcoming any bump in the road that might come their way. This is great for the rat, who does tend to have some less than ideal qualities and also some qualities that tend to come off as very negative to those who don’t know the them very well. The pig female has no problems disregarding qualities of the male rat that others might see as greediness or conniving nature. Even in bed, the rat and pig sexual compatibility is extremely good. Instead the male pig is more likely to focus on the female rat’s charm and amiability, sunny attitude, and good fortune when it comes to money. Pigs are indulgent by nature, but this fits well with the Rats’ own appreciation of the finer things in life. 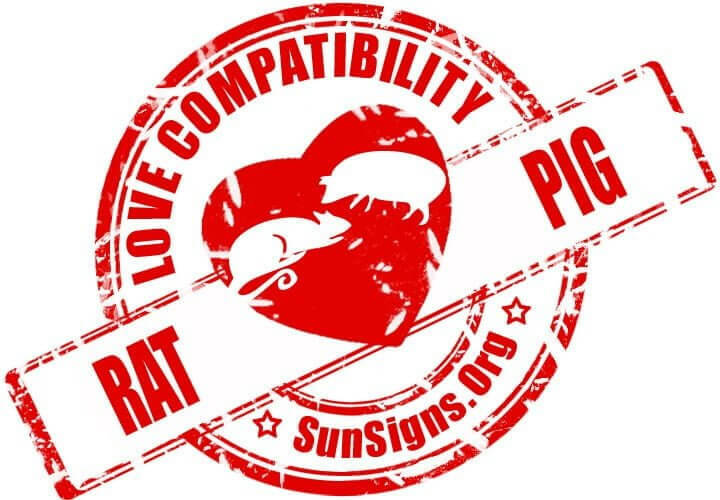 Rat & Pig Chinese Horoscope Compatibility Rated 4 Hearts!